It was a gorgeous day in NJ today so the BFF and I went to Lambertville, which is right across the Delaware River from New Hope. There are lots of high quality craftsmen in the area and antique shops, but, alas, the tiger maple high boy that the BFF had his eye on was nowhere to be found. We had a delicious dinner at Marsha Brown’s, a Louisiana cuisine restaurant in a converted Methodist Church on the New Hope side. 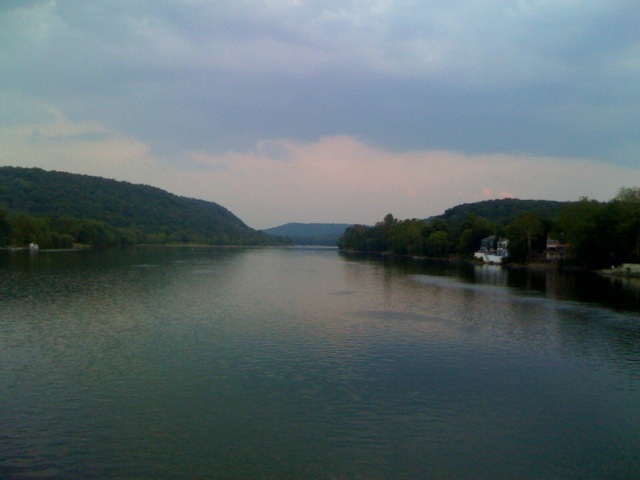 After a bottle of Semillion, we walked back to Lambertville over the bridge. Here is the Delaware at Dusk looking downstream towards the place where George Washington made his historic crossing. Yesterday the Rocky Mountain News asked Senator Obama to “take Denver off the hook” and cover the 11 million shortfall in fund-raising for Denver’s share of expenses for the Democratic Convention. Make the calls to your donors, Sen. Obama. Send the e-mails. Denver should no longer be on the hook for Democratic National Convention expenses. A few exhortations to your supporters could quickly retire the city’s remaining obligations. After all, Denver is simply providing the venue for Barack Obama’s nomination. It’s his party. It’s only appropriate to ask his contributors to ensure that the celebration is a rousing success. Nor cease thou never now! Sing cuckoo now, Sing cuckoo! Sing cuckoo, Sing cuckoo now! Alegre sent me the following email last night. You will find this amusing. So I guess we’ve all heard by now that Barack Obama met with the Congressional Black Caucus on Thursday. About a third of the CBC supported Clinton, and Obama was supposedly there to promote “healing” and unity. But some CBC members received a different message. Sources at the meeting said that Rep. Sheila Jackson Lee, D-Texas, a Clinton supporter, expressed the desire that Obama and his campaign would reach out the millions of women still aggrieved about what happened in the campaign and still disappointed that Clinton lost.